One of the cornerstones of the carfree city is a transport system that provides faster and cheaper movement of passengers than the urban automobile. Many elements of the design are derived from this requirement. The approach is described in this section. 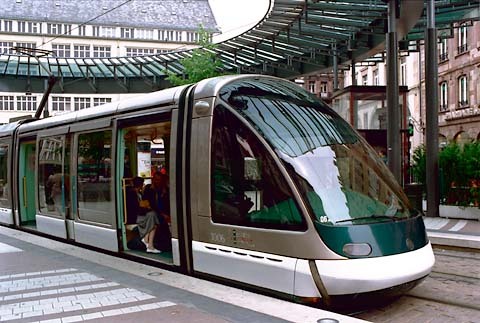 While there has been a great deal of research into alternative forms of urban passenger transport in recent years, a relatively standard form of heavy-rail metro is well suited to the requirements of the city. We have a century of experience with this technology. "People mover" systems would also work, but such systems have been extremely expensive to construct and are not particularly effective at moving very large numbers of people. Typical door-to-door times for trips outside the district are around 20 minutes. 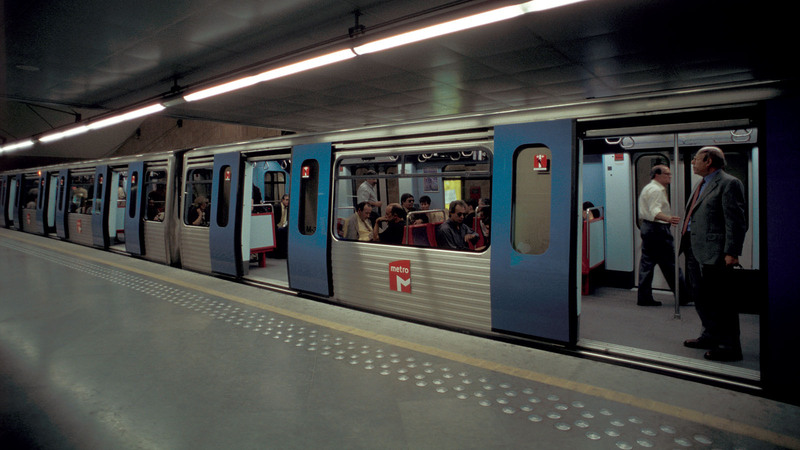 Metro trains run at four-minute intervals all day (except possibly late at night, when an interval of eight minutes is acceptable). Load variations can be compensated for by changing train lengths. While building a heavy-rail metro in an existing city is a very expensive proposition (although quite reasonable when compared to some recent urban highways), the costs can be controlled in the construction of a new city. The ability to combine the installation of water, sewer, power, communication, and transport infrastructure without having to work around existing installed infrastructure is a major simplification. The tunnels can be built using simple cut-and-fill techniques, work can proceed around the clock without disturbing residents, and considerable use of prefabricated concrete components should simplify and speed the process. False-work, the bane of construction projects within cities, is nearly eliminated if unrestricted cut-and-fill operations are possible. The running time between stops is 43 seconds, with a maximum speed of 62 MPH (100 km/hr) being reached. Assuming a loiter of 12 seconds at each stop, the average stop-to-stop time is 55 seconds. The average speed of the metro system, including stops, is about 30 MPH (50 km/hr). This is extraordinarily good for an urban transportation system. The system must operate around the clock because it is the only way aside from bicycling to reach areas that are beyond walking distance. Passenger transport should be a universal public service financed from general city revenues. Visitors could be charged a hotel tax if the costs of providing for their transport must be recovered. No-fare systems impose no unnecessary delays or inconvenience on the passenger. Alternatively, freight rates could be set high enough to cover the total cost of operating the metro system. A tram system (streetcar, trolley, or Light Rail Vehicle [LRV]) could be used instead of a metro. Surface trams could work very well and are quite cheap to build and operate, although maximum travel times would increase by several minutes. The capacity of an LRV system is less than a traditional metro, so surface systems would be limited to cities not exceeding about 500,000 population (assuming the use of the Reference Topology; more complex topologies can provide more routes and thus greater capacity). Within the districts, all trips are on foot (not more than 10 minutes) or by bicycle (less than 5 minutes). The design does not require the use of bicycles to achieve fast and efficient transport. However, in all but very hilly country, the needs of the bicyclist should be kept high on the list of considerations. Unfortunately, few climates are sufficiently mild to permit comfortable year-round bicycling, so the transport system must be capable of handling all transport needs during periods of inclement weather. During good weather, bicycling is pleasant and healthy. Other human-powered vehicles would be used as advantageous, including large-wheeled tricycles (for the elderly), push carts, bicycle rickshaws, etc. Small cart-sized battery-powered vehicles are permitted where their use is essential; there would come to be quite a few of these, but they would not dominate the streetscape because they are quiet and slow. Ordinary ambulance, fire, and police emergency vehicles use the streets. For this reason, a clear traffic lane must be maintained on all through streets. Ordinary police patrols are on foot or bicycle, a more effective means of policing than the use of patrol cars. An intercity train station is located in the heart of the city. A large city requires an airport, which should be located far from town and connected to the center by rail. We turn next to the more difficult problem of moving freight in a carfree city.